London has always been on my bucket list of cities to visit before 25! 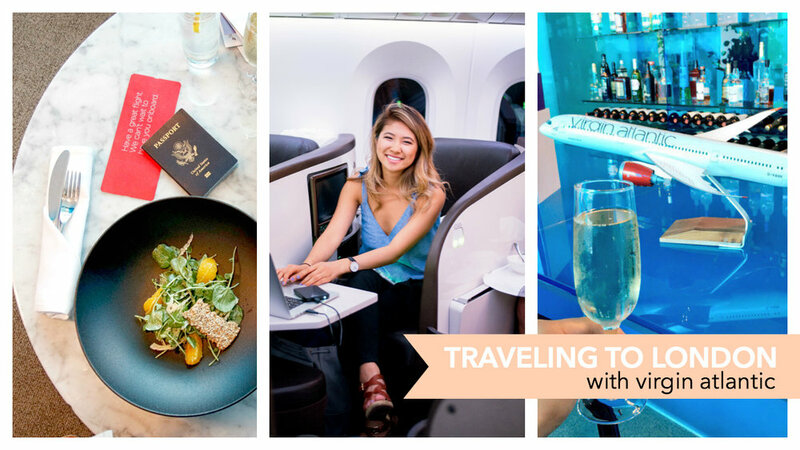 I'm happy to partner with Virgin Atlantic to share the San Francisco to London First Class/Upper Class experience in a visual diary here on my blog. See more photos across my social media #SFOtoLHR! A chauffeur arrived at my home and whisked me away to the SFO airport. I arrived at least 3 hours before my boarding time to fully experience the San Francisco Clubhouse. The first thing I noticed was the relaxing atmosphere of the lounge, light music, and blue tinted windows. Photo Credit: Asideofsweet My casual airport outfit Trench coat and Jeans :: Gap Top :: Zara Here I'm enjoying a delicious cocktail from the new Bourbon & Branch menu at the Virgin Atlantic SFO Clubhouse. What excited me the most about the San Francisco clubhouse was the full menu with tons of delicious vegan and hearty options! I would highly recommend any of the salads, seared cod, salmon slider, and the asian inspired dishes. The clubhouse has table service with extremely friendly staff. We even met Executive Chef Gianpaulo Ruiz! We tasted a new starter from a from a future collaboration with Chef Murphy of Whitechapel SF (the pork and potato croquette is seriously so delicious!) The Boeing 787 Dreamliner perched on the tarmac. In the clubhouse, there was an announcement for my flight. I breezed through security and boarded my flight. Once on board, I was greeted with a smile and a glass of champagne (WOW)! Sitting 30,000 feet in the air! I signed onto the wifi, answered a few business emails, and started to edit a YouTube video in the comfort of my chair! At times I didn't even feel like I was working on an airplane. The table top was roomy and my seat was fully equipped with a power outlet and storage space. There was an entertainment monitor and the best part is, a chair that converts into a bed! Amazing right? Kelly comfy in her pajamas! The best part about this flight was experiencing it with my friends! Check out Kelly's blog and Instagram for more photos @AsideofSweet. I also travelled with Food Blogger Cynthia from Cyneats! In Upper Class, we were served a 3 course dinner with silverware. We were able to choose from a full menu of beverages. There's even a bar on board with snacks if you're still feeling hungry. Check out Emily and Steve who were also a part of this exciting London trip! The lights dimmed to a light purple hue and I stretched out in my bed and fell asleep. When I woke up, I ordered breakfast and enjoyed the sunrise from my window. Landed safely in London! I finally arrived at the Mondrian, a Southbank boutique hotel located by the Thames River. I felt well rested and excited for my first night in London! Thank you Virgin Atlantic for inviting me on a trip of a lifetime to London and the opportunity to share it with my viewers! Sometimes I pitch myself and think, is this really happening? How did I get so lucky? I look forward to sharing the rest of my adventures in a future blog post and a video on my YouTube channel! Add me on snapchat to follow my daily adventures: FashionbyAlly. Thanks for reading! This post was made in collaboration with Virgin Atlantic.